A place is not only a geographical area; it’s also a state of mind. And trees are not just trees; they are the ribs of childhood. The tears flowed freely from my fingers as the bus passed quickly by. Upon our return, the sadness of my childhood came back. This dream standing before me, why didn’t I just wrap it around myself even once so I could say I have felt the joy that kills? The soldiers were guarding the dream, but I will enter it when they sleep. —Where else am I going to find it? I bend to the ground and pick it up piece by piece just as the women of the fellahin pick olives in October, one olive at a time. In the end we realize that this is the poet’s younger self interrogating his older self. The latter speaks of his family, driven into exile in 1948, only to return to find themselves exiles in their own land. Childlike curiosity meets the sorrow born of experience and loss, wisdom and despair. —Where are you from, brother? —I threw a grenade at the conqueror’s car, but I blew myself up instead. —They arrested me and charged me with attempted suicide. —Not exactly. I told them the attempted suicide didn’t succeed. So they liberated me out of mercy and sentenced me to life. —But you were intending to kill, not to commit suicide? —It seems you don’t know Gaza. Distance there is an imaginary thing. —It seems you don’t know Gaza. Where are you from? —And what did you do? —I threw a poem at the conquerors’ car, and it blew them up. —They arrested me and charged me with mass murder. By making individual experience universal, and personifying historical tragedy and loss, Mahmoud Darwish—though his poetry and his prose—stands witness to the fate of his people under occupation. “The homeland,” he claims, “is always at its most beautiful when it is on the other side of the barbed wire fence.” He grieves, and his grief is anything but ordinary. 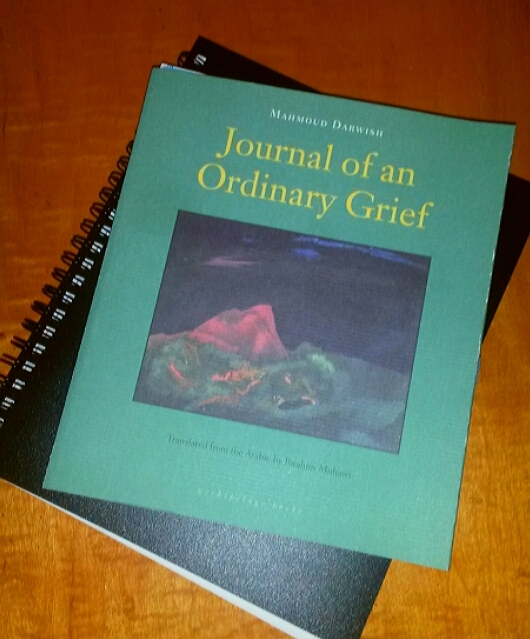 Journal of an Ordinary Grief, translated by Ibrahim Muhawi, is published by Archipelago Books. This is a book braver than I am. I am not even certain where to begin to unravel my reaction to reading this collection of essays. Until recently I was resisting the dawning recognition that what I needed to say—the subjects I wanted to explore—would be best met through essay/memoir writing. Or to put it another way, I realized that I have neither the patience nor aptitude for fiction. But what of the essay and its personalized variant, the memoir? I wasn’t even sure I liked the form. So I have learned to approach reading essays with an eye to writing. I read not simply for the joy of encountering well-crafted, intellectually and emotionally engaging prose. A work that excites me, in style, content, or both, invariably sends me to my current notebook where I spin, inward and outward, a cascade of thoughts, images, and ideas… fuel for my own scribblings. 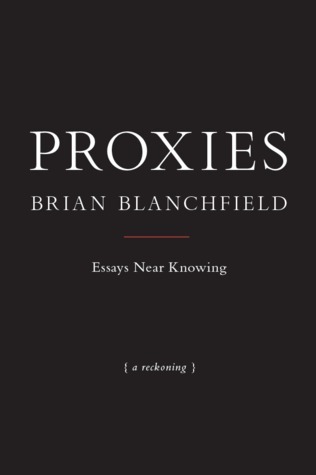 Proxies, by the American poet and essayist Brian Blanchfield, is one such work. Having determined that this would be unresearched essaying, analytic but nonacademic, I was almost immediately drawn to a second constraint—or better, invitation: to stay with the subject until it gives onto an area of personal uneasiness, a site of vulnerability, and keep unpacking from there. As he hits these points of reflection that effectively bend the essay toward memoir, there is, he admits, a certain fumbling allowed, stimulating a transition that, in its sometimes sudden movement, creates an energy that is dynamic, emotionally raw. What begins as a focused consideration of a topic, a concept, or theme, seems to turn personal in a heartbeat, and works its way through to a resolution, however ambivalent that may be. No grand narrative arcs here, only furtive digging through the fragmented moments of life, each essay preceded by the same caveat: Permitting Shame, Error and Guilt, Myself the Single Source. Blanchfield’s starting points are varied. As a poet, it is not surprising that many start with language and meaning: “On Propositionizing”, “On Confoundedness”, “On Abstraction”, “On the Ingénue”, “On the Near Term”. Some have more tangible contexts at the outset: “On Minutes”, “On the Leave” (as in the game of pool), “On Dossiers”. He often draws on specific images from his own life to set the stage, but those musings typically lead him much closer to the bone as the essay takes shape. 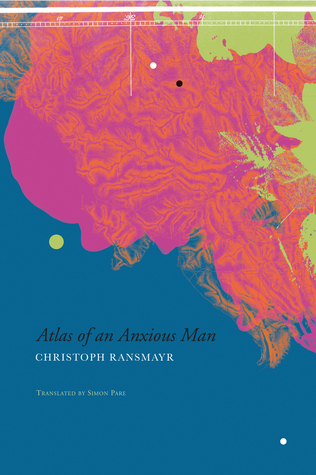 Relationships with his parents, the tenuousness of his chosen profession, and his sexuality—his queerness of being—are common themes that regularly surface as he ventures into those areas of private anxiety and susceptibility. As personal as he gets, and he can lay himself bare, these essays are rich with fascinating intellectual ideas, with references to philosophers, psychologists and, naturally, poets. Some essays are simple and relatively self-contained, while others seem to mutate, in the reading, as the author reaches for a subject that expands, like a pool of liquid, resisting the ordered shape one might anticipate. At best, at their most intriguing, these are essays meant to be experienced as much as read. The word choice is inexplicable, querulous, oblique, just right. A paraphrase among the rows of roses—a relief receding there—renders their locked pattern a kind of language, but what can it say? ; and the head in the place where the living being lay is nominated as this titular hermeneutic tool, useless as such without its objective genitive of. It cannot be said what original locution this paraphrase summarizes. A case, I think, for Crane, of Flesh Made Word again. A reversion. Revelation withdrawn. The essay winds down with thoughts of Crane who, fittingly, worked an office typist; and the speculation that the imagined head on the bed might have been that of his lover’s father. Some strange, small circle, elegantly wrought from very humble beginnings. 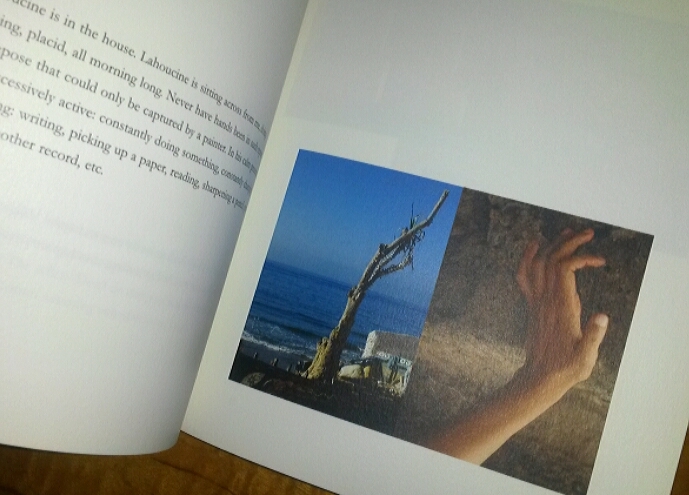 The essays in this book move like this, through memories, reflections, ideas and poetic contemplation. Since I began this project, I have tried a number of times to write about my mother and me, and have abandoned a few attempts already. If these essays are, in part, inroads to disinhibited autobiography, as I have come to claim they are, and demand they be, I feel the imperative to address the subject above all others. But ours is a relationship so deep and damaged and (still) so tenuous it has defied emergence. It is more than embarrassing to relate all of this. I come up against the inappropriateness of, for one thing, sharing what is only half mine to share. But is that partiality, expressed by that proportion—half of one—ethical, or healthy for a grown man? Roland Barthes has famously said that to be a writer is, essentially, to violate a primal taboo, to “play with the mother’s body.” No, I love Barthes and he is a signal influence on my conception of this very book; but the remark presumes a class and level of literacy I was not born into. The resulting essay achieves a surrogate catharsis of sorts, but not between the author and his mother. The roots of their (as yet) unresolved divide lie deep in the American south where Blanchfield was raised in a Primitive Baptist family. He had to leave to live openly as a gay man, moving to New York City in his early twenties. The years that have passed, and the miles that have separated them have not healed the rift. Honestly sharing the pain of rejection, the frustration at his mother’s inability to come to any terms of respectful disapproval, and the sting of hearing her say “I shouldn’t have to choose between my God and my son” leaves a deep sorrow that lingers on the page. Essayists are no strangers to the practice of blending intellectual and literary observations with autobiographical reflections. What Blanchfield seems to approach here is a means of allowing himself, as a writer, to push his way inward, passing from the factual (more or less), the abstract or the sentimental into the territory of the immediate, the raw, and the real. He touches nerves (his own) but avoids falling into two traps that can snare those who venture toward autobiographical writing: the artificial narrative and the open air confessional. At the most personal end of the spectrum, what he is sharing are unguarded moments of naked emotional vulnerability, decidedly queer, but recognizable and resonant to anyone who has lived, loved, won and lost. For prospective or developing essayists, Proxies is, as a project, idiosyncratic, bold and illuminating. Barthes’ essays, as he admits, are an ever present influence and Blanchfield demonstrates a similar natural ease with the form. To be able to unfold ideas and follow their course without fact-checking is an interesting exercise in itself, useful at the very least in drafting an essay in its early stages. Lifewriting in this format offers ample reward for readers and some significant points of interest for those of us who struggle to achieve the balance between a story we want to explore and the open wounds that may not have quite healed—the truths that give a personal essay its soul. For me, this book generated a series of provocations, flash points for my own writing, current and potential. I loved the way Blanchfield focuses in on ideas and uses them as pivot points to make his way from concept to experience and back to ideas. 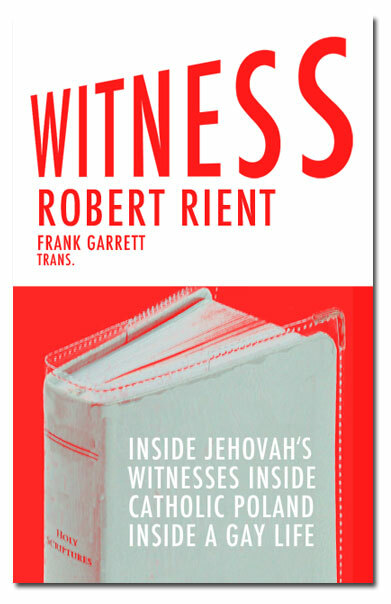 It took me, I confess, over a month to read this collection of twenty-four short essays. But in that time I lost both of my parents, the outcome of two intersecting, but unrelated series of events. I sat long at the bedsides of both my mother and father, witness to their final days. I want to attempt to capture the immediate experience, in its unfiltered rawness, before my memories begin to become distorted by time. I gleaned some possibilities, some instances of inspiration, some ideas to bring into my own project which will be, in its own way, necessarily imprecise, emotionally liable, and queer. And that, to borrow from the title of the final essay, will suffice for the near term. Proxies: Essays Near Knowing is published by Nightboat Books. 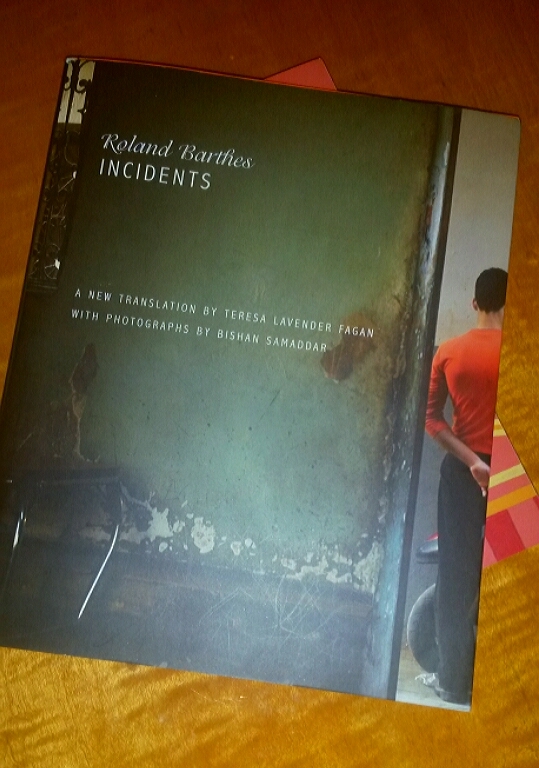 In his Publisher’s Note to the French edition of Roland Barthes’ Incidents, a collection of essays published shortly after the theorist’s death in 1980, François Wahl suggests that the four very different texts assembled form a coherent whole because each piece “strives to grasp the immediate”. These are not theoretical or critical investigations in any sense, rather, in each text, Barthes is immersed in the moment, observing, reflecting, and recording his reactions. There is an unchecked flow and intimacy, by turns nostalgic, sensual, and melancholic but always tuned to the instance of occurrence: to the incident. These are works that invite the reader to engage with all five senses, mediated through words and memory–they are not formal pieces but rather take the form of journal entries, diary writing, and fragmented travelogue. Barthes writes people and he writes place, never really entirely at ease with too much of either. Delight, boredom, and sadness filter through his reflections creating an immediacy that is at times startling. He is not writing for posterity, he is writing for himself.
. . . noble and subtle at the same time; it is never grey, never gloomy (even when the sun isn’t shining); it is light-space, defined less by the altered colours of things . . . than by the eminently inhabitable quality it gives to the earth. I can think of no other way to say it: it is a luminous light. You have to see this light (I almost want to say: you have to hear it, hear its musical quality). In autumn, the most glorious season in this land, the light is liquid, radiant, heartbreaking since it is the final beautiful light of the year, illuminating and distinguishing everything it touches. . . He goes on to turn his attention to the elements of the south west that resonate with different aspects of his childhood, to reflect on the way that memories formed in childhood inform way we remember the places associated with that time, the magical spaces and the difficult times will each carry their own tone, their own qualities. The title piece is the earliest in the book. Recorded in 1969 when the author was in his mid-50s, “Incidents”, as the name implies, captures moments from an extended stay in Morocco through an incidental series of fragmented encounters and experiences. Here, people form the scenery; with a special attention reserved for young men. Barthes demonstrates a a particular eye for detail (and somewhat of an obsession with hands) in these passing observations, combined with an acute sensitivity for scents and colours. The vibrancy, shades and contrasts of the country come alive. As a reader you become aware of the blinding light, the dark shadows–they are not described, you sense them in the background. A young black man, wearing a crème de menthe-coloured shirt, almond green pants, orange socks and, obviously, very soft red shoes. A handsome, mature looking young man, well dressed in a grey suit and a gold bracelt, with delicate clean hands, smoking red Olympic cigarettes, drinking tea, is speaking quite earnestly (some sort of civil servant? One of those who track down files? ), and a tiny thread of saliva drips onto his knee. His companion points it out to him. Some young Moroccans–with girlfriends they can show off in front of–pretending to speak English with exaggerated French accents (a way of hiding the fact without losing face that they will never have a good accent). The art of living in Marrakesh: a fleeting conversation from open carriage to bicycle; a cigarette given, a meeting arranged, the bicycle turns the corner and slowly disappears. The Marrakesh soul: wild roses in the mountains of mint. Isn’t it the material of modern art today, of daily art, light? In ordinary theatres, the light originates at a distance, directed onto the stage. At Le Palace, the entire theatre is the stage; the light takes up all the space there, inside of which it is alive and plays like one of the actors: an intelligent laser, with a complicated and refined mind, like an exhibitor of abstract figurines, it produces enigmatic shapes, with abrupt changes: circles, rectangles, ellipses, lines, ropes, galaxies, twists. This collection closes with “Evenings in Paris” a series of journal entries from 1979 that open with words Schopenhauer wrote on a piece of paper before he died: “Well, we’ve escaped very nicely.” The Barthes who comes through in this selection is tired, often impatient with colleagues and irritated by noise. A certain loneliness and dissatisfaction underscore his descriptions of dinners with friends, failed attempts to win the affections of the younger men he covets, and an unresolved mourning for his beloved mother. Most nights he finds himself heading home alone, half despairing, half relieved, to settle into bed in the company of Pascal, Chateaubriand, Dante, or the echoing ghost of Proust. Although he still enjoys longingly watching attractive men, he has little patience for crowds or social functions. This is a heavier, more emotionally intense offering, the intimacy of “the immediate” weighs heavily as Barthes commits his thoughts to paper, unaware in the writing as we are in the reading, that he is nearing the end of his life. The guy who sells Charlie-Hebdo walks by; on the cover in the publication’s idiotic style, there’s a basket of greenish heads that look like lettuces: ‘2 francs the head of a Cambodian’; and, right then, a young Cambodian rushes into the café, sees the cover, is visibly shocked, concerned, and buys a copy: the head of a Cambodian! Not without a little social commentary, even in a deeply personal journal, Roland Barthes, remains ever relevant down the years. Reading Incidents is, in itself, a sensuous experience, it is doubly so in this edition from Seagull Books. With a sparkling fresh translation by Teresa Lavender Fagan and illustrated with the evocative photographic images of Bishan Samaddar, this collection of writings becomes one that can, as Barthes himself would have intended, be savoured. 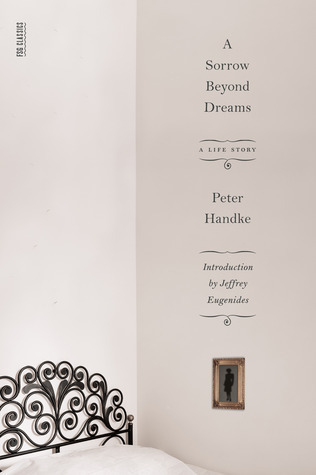 With this simply stated aspiration, Austrian writer and dramatist Peter Handke set out to capture the essence of his mother’s life and chronicle the painful spiral that swept her into a darkness which would lead her to take her own life at the age of 51. Written over two winter months in 1972, the result is a slight volume, 69 pages, that can be read in afternoon. But length can be deceiving. Tracing out a life that spanned the rise of the Nazis, the Second World War, and the austerity and suffering that followed, A Sorrow Beyond Dreams is a spare and elegant memoir from which the reader emerges drained and aching alongside its author. From the outset he admits that he is seeking an element of closure in the act of putting words to paper, but he wishes to avoid an overly sentimental account, concerned that he risks turning his mother, a real person, into a “character.” He intentionally adopts a more distanced perspective. He does not refer to her by name, and when he recounts the events of his early years he is “the child” or one of “the children”. He employs capital letters for emphasis (“she was a woman who had been ABROAD”). But there is another motive as well. He sees in her life an illustration of the social restraints that defined and limited the lives of so many women from poor rural communities such as the small Austrian village where she began and ended her life. As such he wishes to present her life story as one that is at once personal and exemplary. The portrait he paints of his mother is one of a spirited young woman, who was denied her pleas to be allowed to continue her studies, for an education beyond the basics was not to be squandered on girls or women. So she ran away to the city to study cooking – not exactly an academic pursuit, but again the only option open for her. She thrived in her new environment: a world of new friendships, fashions, opportunity, and the heady comraderie that accompanied the rise of National Socialism. The outbreak of war only added to the excitement as young soldiers, away from home and lonely, flooded into the city. She met and fell in love with a married man. Before long she was pregnant, but by the time her son Peter was born she had married another man. Her first romance would remain her only true experience of romantic love; what she had with her husband was a disappointing, often hostile, and very lonely existence. After the war the young family spent a few years in Berlin, living amidst the rubble. A second child is born there. (Over the years she will have two more children and secretly abort three others with knitting needles.) In 1948 they flee Germany and return to Austria, where she finds herself back in her family home, trapped again in a restricted environment, her life once more defined by the Catholic shame and guilt of village life. Economic conditions at this time were harsh and her husband’s drinking and difficulty holding employment did not help. She responded with the only strategy available: “pure scrimping; you curtailed your needs to the point where they became vices, and then you curtailed them some more.” Necessities would be wrapped up and handed out at Christmas. As Handke recalls, “I was sincerely grateful for the most indispensable school materials and spread them out beside my bed like presents.” Yet she did not look to the possibility that life might hold more for her than housework and continually making the rounds required to keep her drunkard husband employed, creditors from the door and paperwork up to date just to assure access to the most basic benefits. For a while she become more engaged in the community, showed more compassion to her husband, and things might have improved but the disappointments of home life still seemed to defeat her. She began to have headaches. She started to withdraw from community life. Her spirit sagged and no one could tell her what was wrong until a neurologist in the city identified her condition as a “nervous breakdown”. With the comfort of having an explanation and medication to ease the pain, she eventually improved. There would be a respite. But in the end despair returned. In November of 1971, she wrote farewell letters to her each member of her family. Then one evening after dinner with her daughter and an evening watching TV with her youngest son, she took all of her sleeping pills and all of her antidepressants and laid down on her bed to welcome that final rest. If Handke had imagined that in writing this account of his mother’s life he would be able to achieve some peace himself, he discovers, in the end, that that is not the case. The story continues to preoccupy him, to haunt him. Facing memories head on is an act of confronting horror but it does not ease it. The horror arises from the persistent attempt to reflect a truth. He admits that at times he longed to be able to lose himself in a fiction, to be able to tell lies for a while, write a play instead. 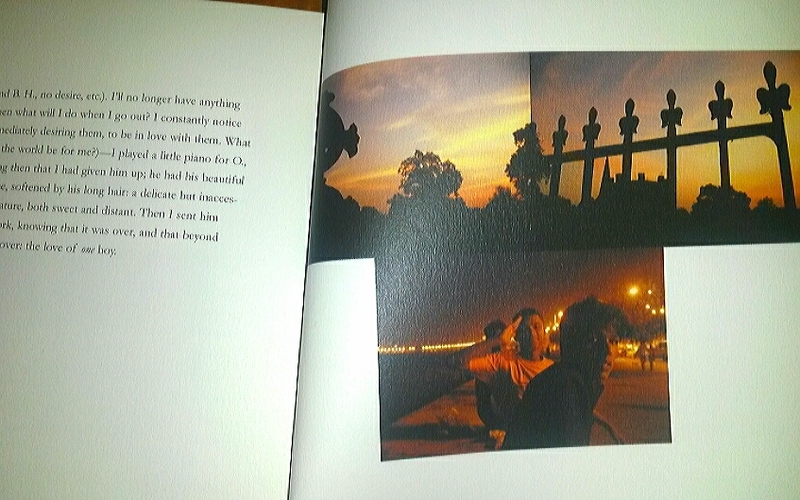 No longer able to stay out of the frame, he closes the book with a collection of images, remembrances, and brief personal confessions. The result he achieves is a memoir stripped to its essentials, but delivered with stark, beautiful prose. 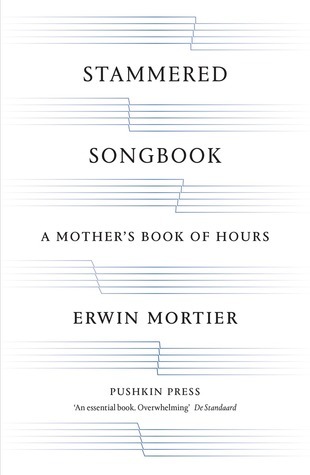 His love comes through in every phrase as he recounts his mother’s story, and the emotions that arise as he sees her through the final rituals of her shortened life are real, complicated and raw. *A Sorrow Beyond Dreams, translated by Ralph Manheim with an Introduction by Jeffrey Eugenides is published by Farrar, Straus and Giroux.